This Best Strawberry Corn Salsa recipe is one you can’t miss! Sweet strawberries and corn with plenty of spice from habanero peppers, all in a sauce made with zesty lime, cilantro, parsley, scallions, and olive oil. 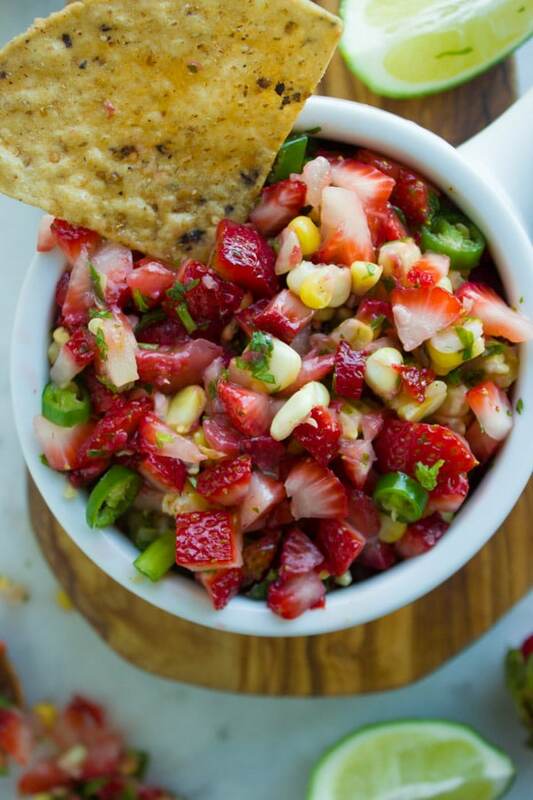 I’m so excited to share this Strawberry Corn Salsa recipe with you. I have a soft spot for quick, simple and fresh salsas like this. And I have another soft spot for Mexican anything stuff. It’s like I have a hidden Mexican gene that I’m not aware of. I don’t know what it is about Mexican food, it’s the freshness, the spice, the flavors, and the cilantro I think! This Best Strawberry Corn Salsa recipe is one you cannot miss! Sweet strawberries and corn with plenty of spice from habanero peppers, all in a refreshing sauce made from zesty limes, cilantro, parsley, scallions and olive oil. 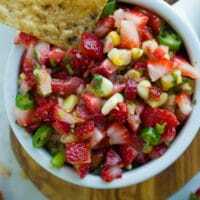 Strawberry Corn Salsa is the perfect way to start your BBQ, and it pairs wonderfully with anything you plan to serve it with. It’s seriously the best salsa you can make. Oh, and did I mention it takes 5 minutes to prepare? Now here’s the perfect way to celebrate! 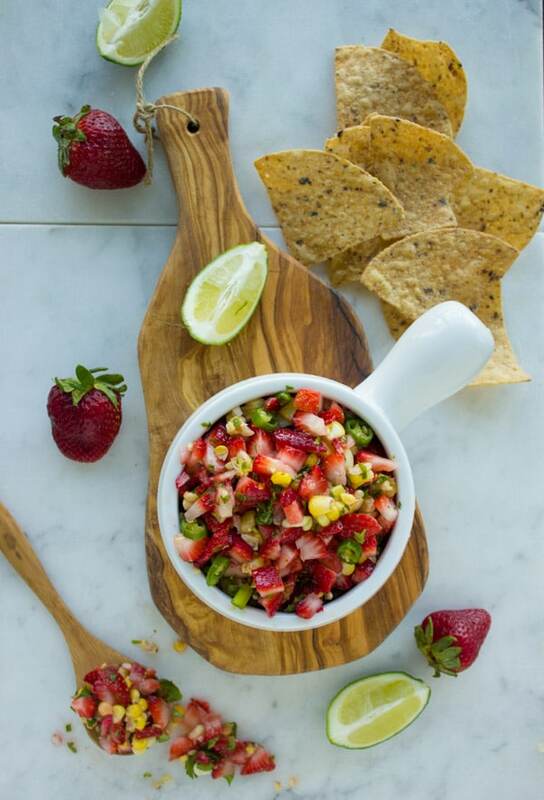 The combination of strawberries and corn in this Strawberry Corn Salsa makes for the perfect balance of sweetness and different textures. Juicy strawberries go so well with the slightly crunchy fresh corn. I know a bunch of people who will not eat cilantro. This phenomenon is actually super common and it has to do with a genetic composition which lets certain people detect a common type of aldehyde found in both soap and cilantro! If by any chance you or someone you know is not a cilantro fan, go with parsley alone! 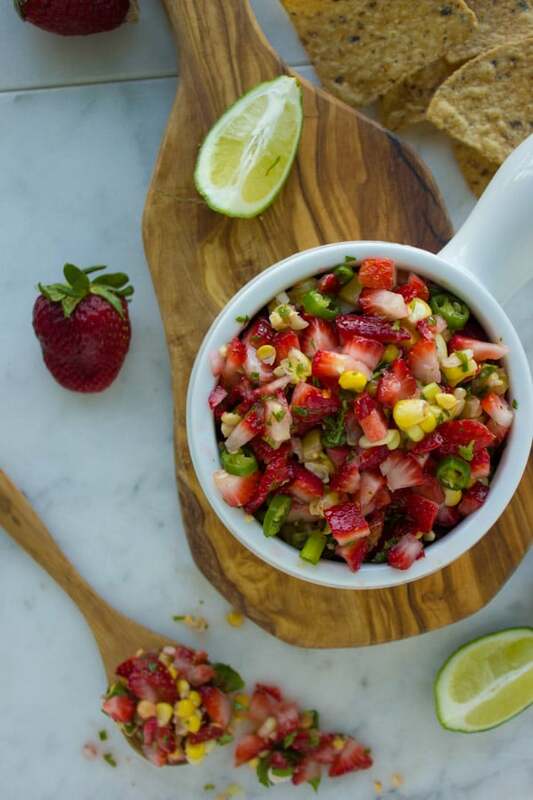 The recipe for this Strawberry Corn Salsa could not be easier! In a medium bowl, add the scallions, herbs, salt, lime and olive oil. Mix them well and then add in the fresh strawberries and corn. 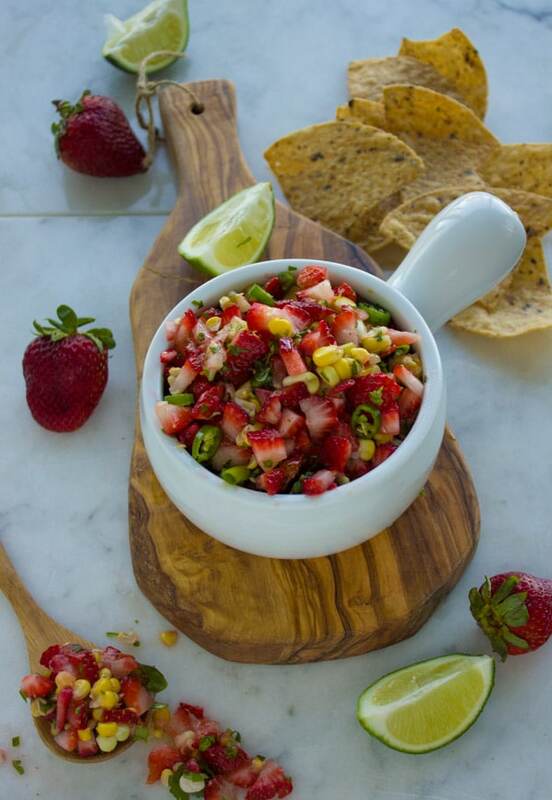 Mix the Strawberry Corn Salsa and serve it with chips, or use it as a topping for your grilled goodies! 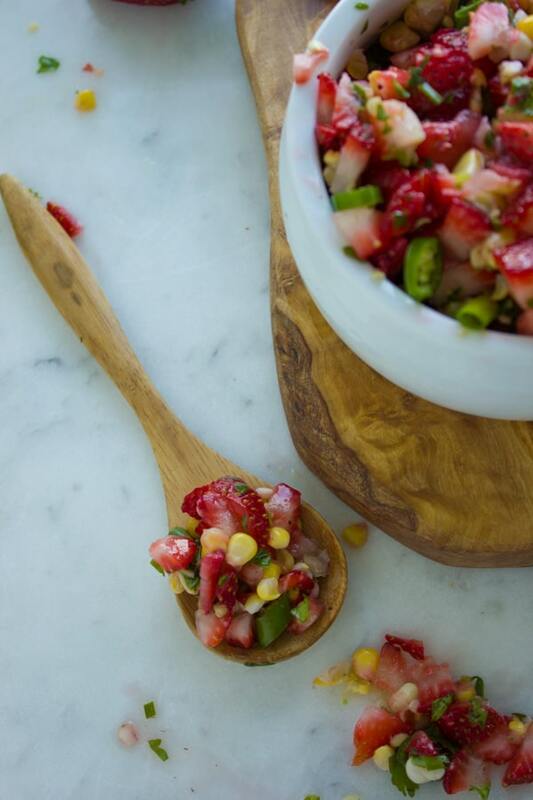 To be honest, this Strawberry Corn Salsa also tastes amazing with an Italian twist. Why not add some basil, scallions, olive oil, lemon and a touch of balsamic vinegar? Or like I mentioned earlier, with parsley alone. Want to spice things up further? Add some freshly grated ginger! I strongly urge you to make this recipe for Strawberry Corn Salsa right away- it’s a perfect way to celebrate! I love it just as a snack, or as an appetizer for a summer BBQ. It’s perfect to serve as a salsa over grilled chicken and is a great potluck recipe, too. Not everyone loves cilantro! If by any chance you or someone you know is not a cilantro fan, skip it and go with parsley! I love adding a touch of spice to this Strawberry Corn Salsa. I used a mix of Thai and habanero peppers so I mixed them up, but jalapeño works wonderfully here too. If you’re not a spice person, then skip the chilies altogether. This Strawberry Corn Salsa can be made with fresh corn, but I prefer cooked corn (either boiled or grilled). I feel it’s not the best picnic or make-ahead recipe because the strawberries might start to wilt. The good news is it really takes 5 minutes to prepare so you don’t have to worry about anything except enjoying it! Looking for more recipes with corn and strawberries? Try Goat Cheese Pistachio Coated Strawberries, these Strawberry Brie Lollipop Pies and this ever so simple Strawberry Caprese Salad. When it comes to corn, I can only think of my all-time-favorite Cheddar Zucchini Best Cornbread Recipe. This Best Strawberry Corn Salsa recipe is one you can not miss! Sweet strawberries and corn with plenty of spice from habanero peppers, all in a sauce made with zesty lime, cilantro, parsley, scallions and olive oil. In a medium bowl, add the scallions, herbs, salt, lime and olive oil. Mix them well and then add in the strawberries and corn. Mix the salsa and serve with chips, or top it over your grilled goodies! I love adding a touch of spice to this Strawberry Corn Salsa. I used a mix of Thai and habanero peppers so I mixed them up, but jalapeño works wonderfully here too. If you're not a spice person, then skip the chilies altogether. I feel it's not the best picnic or make-ahead recipe because the strawberries might start to wilt. The good news is it really takes 5 minutes to prepare so you don't have to worry about anything except enjoying it!